The history of Botswana is tied to that of both South Africa and Great Britain, the latter from which Botswana received its independence in 1966. Until that time, Botswana had been the British protectorate of Bechuanaland, and it adopted its new name upon its independence in September of 1966. Fortunately, their independence coincided with the discovery of huge diamond mines, giving a burst of growth to the national economy and creating the foundations for economic stability. Today, the people of the country are considered ‘Tswana’, even though only 60% of the population consider themselves descendants of this tribe. Another 25% are Kalanga, the second largest ethnic group, followed by the Baherero and Khwe (bushmen). The Khwe were the first inhabitants of Botswana and thought to have occupied Botswana for at least 30.000 years. Today they have been moved to the margins of their original territories, which are now occupied by national parks. Most of the inhabitants are concentrated in the eastern part of the country where they practice farming and semi-nomadic husbandry. The other 10% of the population live in the larger cities: the capital of Gaborone, Maun, Francistown, Lobate and Selebi-Phikwe. Outside of the big cities, the rest of the country is dappled with small, isolated villages. Botswana has one of the lowest population densities in the world, and thanks to the political importance given to tourism and environmental conservation, it has become known as “the best kept secret of Africa”. The fauna of this country is as variable as it is breath taking. Botswana boasts the highest concentration of elephants in the world and one of the most amazing natural phenomena: the Okavango Delta. Botswana, in fact, would be entirely covered by the deserts of the Kalahari if the Okavango, flowing from Angola and Namibia hadn’t opened its delta between the desert sands almost a thousand kilometres from the sea! This phenomenon created hundreds of islands, canals and swamps populated by elephants, hippopotami, lions, leopards, eagles and pelicans. The country has a good highway system connecting the major cities but not the major tourist attractions, forcing travellers to rent expensive off road vehicles and even small aircraft to visit the most beautiful sites. This, coupled with the fact that the few accommodations that exist are quite high-end, makes Botswana an expensive destination. This being said, a trip to this country is a good investment as it bestows upon the traveller a true sense of awe as one finds oneself in immersed in a virgin environment painted with landscapes of incomparable beauty and unimaginable contrasts. In 2014 the Okavango Delta became a UNESCO World Heritage Site. This delta in north-west Botswana is comprised of permanent marshlands and seasonally flooded plains. It is one of the very few major interior delta systems that do not flow into a sea or ocean. One of the unique characteristics of the site is that the annual flooding from the River Okavango occurs during the dry season, resulting in a synchronisation of the biological cycles of native plants and animals with these seasonal rains and floods. It is an exceptional example of the interaction between climatic, hydrological and biological processes. The Okavango Delta is home to some of the world’s most endangered species of large mammal, such as the cheetah, white rhinoceros, black rhinoceros, African wild dog and lion. The Okavango River originates in Angola, where the Cubango River snakes its way down from the mountains and then enters into Namibia taking on the name Kavango and changing its course. At the border between Botswana and Namibia, it reaches a tectonic trough that forces it to broaden forming what is known as the panhandle. It then spills out over the desert into a vast array of endlessly twisting channels, filling the parched earth with life-giving waters. Here there are various lodges which offering a variety of activities such as boat excursions and fishing trips. Continuing its course, the Okavango meets the Kalahari, where it begins to fan out and be absorbed by the desert, creating a watery wonderland of serpentine channels, magical lagoons, wildlife-rich islands and waterlogged meadows before finally being consumed by the vast sands of the ever-thirsty Kalahari. The Okavango Delta is a unique wilderness of profuse wildlife, providing a home to some of the largest concentrations of the world’s most formidable animals. Elephant and buffalo are common everyday sightings while hippopotami and crocodile lurk in every channel. Lions and leopards prowl the night while their prey, the antelope, can be seen everywhere in huge abundance. Troops of baboons and vervet monkeys are also frequently seen, and the ever-present birdlife adds constant variety and movement to the changing landscape. With patience you can also spot cheetah, giraffe and rhinoceros and small reptiles such as lizards, snakes and others too numerous to mention. Nestled amongst this primeval wilderness are a few isolated villages continuing their age-old existence. The best period to visit this region is from May or June to September when the climate is dry, the days are hot, nights are cool and the water level of the delta is at its highest. October is the hottest period, but it’s a good time for a visit if you’re hoping to spot some wildlife as the climate is warmer and the water level is lower, making it a little easier to see animals as they come out to drink in the few channels left from the river.The Delta is divided in two sides: the eastern side and the western side. The eastern side is easier to access from Maun by car (four-wheel drive), and it’s the best side for visitors who don’t have much time. It’s also less expensive since you can participate in game drive safaris anywhere from 1 to 3 days, leaving from Maun and sleeping in mobile tented camps. The other side of the Okavango, in the northern and southern part of Moremi Park, are definitely the wildest and are accessible only by light aircraft. The Moremi Wildlife Reserve is a game reserve on the eastern side of the Okavango Delta. Thanks to its policies on eco-tourism, Botswana has been able to keep this area in a pristine state, allowing visitors to experience Africa in its most natural, unspoiled and impressive condition. The reserve contains about a quarter of the Okavango Delta and stretches across several thousand square kilometres. It is comprised of a variety of landscapes including beautiful forests, lagoons, floodplains and islands, the biggest of which is Chief’s Island and accessible only by light aircraft or Mokoro. Then there is the Moremi Tongue, the most frequented area of the reserve along the eastern border, which is accessible by car (four-wheel drive). At the northern tip of Moremi, there is an area called Khwai, where evergreen trees line wide floodplains, lagoons and islands. In order to access the reserve, you must stay in one of the lodges or one of the established camps (free camping is not allowed); if you do not have a reservation in one of these two, access to the park will be denied. The best time of the year to visit the Moremi Reserve is from May to October during the dry season when animals arrive at the permanent watering grounds such as the Chobe River, the Okavango Delta and the Moremi Game Reserve. Despite being at the end of Botswana’s cool dry winter, September and October deliver some of the hottest weather of the year. If you can handle the heat, game viewing at this time ranks among the best in Africa. Huge number of animals and their ever-ready predators are clustered around meagre water and grazing sources. January and February are very wet making some of the roads inaccessible. Night safaris here are not allowed as in other areas of the Delta. The Chobe River forms the Chobe National Park’s northern border. Descending from Angola where it is known by the Hambukushu name, Kwando, it takes on the name Linyanti as it reaches Botswana, finally becoming the Chobe at the border of Ngoma. The Chobe runs along the northern border of Botswana, meeting the Zambezi and tumbling over the fault-line of Victoria Falls. In the National Park there’s only one paved road, and it’s the one that connects Ngoma Bridge and Kasane, the rest of the roads are all dirt roads, accessible only by 4×4 vehicles. Kasane is a small town in Botswana, where four countries almost meet, Botswana, Namibia, Zambia and Zimbabwe. 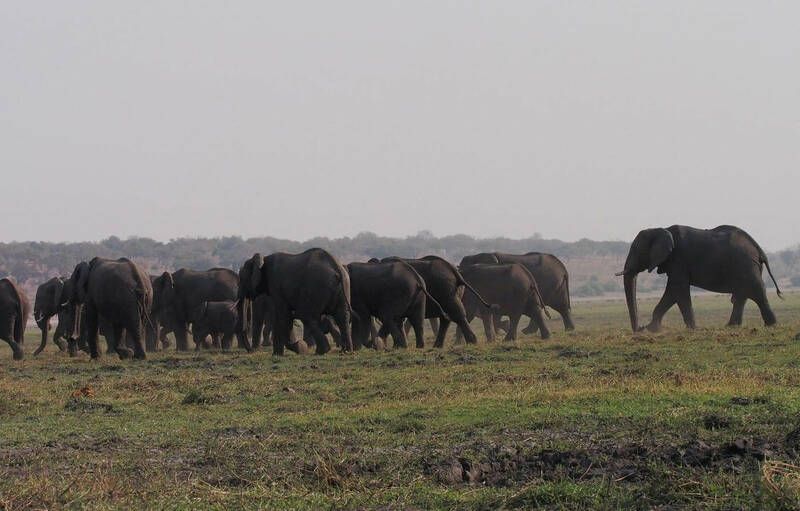 It serves as the administrative centre of the Chobe District and all tours to the National Park start from here. •	Serondela is situated along the northern river bank. The main features of this area are the dense woodland and floodplains which make it a major watering spot, especially in the dry season, for large breeding herds of elephant. It’s definitely a once in a lifetime experience to be able to see this amazing show. •	The Savuti Marsh area constitutes the western stretch of the park and is, for the most part a relic of a large inland lake whose water supply was cut off by tectonic movements. Nowadays the marsh is fed by the erratic Savuti Channel, which dries up for long periods and then curiously flows again, a consequence of tectonic activity in the area. It is currently flowing again and in January 2010, it reached the Savuti Marsh for the first time since 1982. As a result of this variable flow, there are hundreds of dead trees along the channel’s bank. The region is also covered with extensive savannahs and rolling grasslands, which makes wildlife particularly dynamic in this section of the park. During the dry season, tourists going on safari often see warthogs, kudus, impalas, zebras, wildebeests and even elephants bullying one another. During the rainy seasons, the birdlife springs into action with the movement and song of over 400 species of birds. Packs of lions, hyenas, zebras and, more rarely, cheetahs are visible as well. This region, in fact, is well known for hosting an annual migration of various predator and prey, and many documentaries about lion attacks on elephants during the end of the dry season have been shot here. •	The Linyanti Marshes are adjacent to Linyanti River and the main highlights of this area are the open woodlands, the lagoon and floodplains. Being geographically part of the Chobe, these elements create a landscape similar to that of the Delta, but because the government doesn’t consider it as part of the national park, night and walking safaris are allowed. •	The Nogatsaa and Tchinga area is located between the Linyati and Savuti Marshes. It is a dry hinterland, mainly occupied by Nogatsaa grass woodland. It is a series of natural pans and man-made artificial water holes, put into place in hopes to relieve wildlife pressure off the Chobe river, manned and monitored by the Department of Wildlife and National Parks (DWNP). Four of the artificial water holes also have “hides” (raised wooden platforms) in which one can quietly observe wildlife. This area is small but still you can spot many elephant, buffalo and other wildlife. The Tsodilo Hills are situated at the north western boarder and accessible only by 4×4 or light aircraft. The area was designated a UNESCO World Heritage Site in 2002. Within the area there is abundant rock art, many rock shelters, depressions and caves standing on the sandy, sacred territory of the San people of the Kalahari. These hills contain over 4.000 paintings, preserved in an area of only 9 square kilometres of the Kalahari Desert. The archaeological records of the area give a chronological account of human activity and environmental changes occurring since the Paleolithic and Iron Age. Exploring the three main hills (Male, Female, and Child) is a journey into antiquity. Archaeological research estimates that Tsodilo has been inhabited for the past 100.000 years, making it one of the world’s oldest inhabited sites. Pottery and tools date back 90.000 years. There are different walking itineraries, and in some, a local guide is necessary. There are also a few camps in the area and free camping is allowed. Within striking distance of the water-drowned terrain of the Okavango Delta, Chobe River and Linyanti Marshes lies Makgadikgadi, the largest network of salt pans in the world. These pans are situated in the middle of the dry savannah and they are all that remains of the previous lake which once covered an area larger than Switzerland but dried up several thousand years ago. During the dry season, time and space simply stop and visitors find themselves in a surreal world where getting lost is easier than one might think. If you want to travel this area, you will need to be fully accessorised. The intense heat and the endless silver landscapes create mirages of lakes that do not exist and small rocks become mountains as the viewer loses all sense of space. The wet season begins between November and December, and during this time, this reserve can offer good wildlife viewing, particularly when large herds of zebra and wildebeest begin their westward migration to the Boteti region. Other species include gemsbok, kudu, giraffe, springbok, pelican and flamingo. Makgadikgadi isn’t a single pan but a collection of many pans with sandy deserts in between, the largest pans being the Sua (Sowa), Nwetwe and Nxai. The Sowa Pan is accessible by any type of car in the dry season, but only by 4×4 with GPS during the wet season. Kubu Island is a rocky outcrop situated in the Sowa depression. This crescent-shaped granite island is about one kilometre long, and its slopes are littered with fossil beaches of rounded pebbles, an indication of the prehistoric lake’s former water levels. Fantastically shaped baobabs perch on the island, and they are surrounded by the white salt surface of the pan, making a unique atmosphere. On the north eastern side of the Sawa Pan there’s an incredible area called Nata Sanctuary covering 250 square kilometers comprised of both grasslands and pans, in an important environmentally sensitive area. During the wet season the Nata River flows again, and thousands of flamingo, pelican, duck and geese come out and populate the small lakes created by the river. The scene is indeed inspiring, and an elevated hide provides an unbeatable panorama of the pans. The present park covers some 4.900 square kilometers. Both dry season and wet season visits to this park are recommended in order to witness the dramatic transformation of the pans at their driest to the watering hole wonderland that they become as they play host to wildebeest and zebra as they migrate north during the wet season. The Boteti River makes up the Western boarder of the park. During the rainy season the Boteti discharges into the Makgadikgadi Pans bringing the area to life with seasonal activity and high biological productivity. Inside the national park, it’s possible to find accommodation in camps or lodges, the most expensive of which include quad excursions around the salt pans. This park is an area of 2.500square kilometres of landscape dotted with clusters of umbrella acacia and Mopane woodland. During the rains from November to April, the pans become covered in grass and you can spot herds of zebra, wildebeest, gemsbok and giraffe. To the south of the reserve lies Baines’ Baobab area, overlooking the Kudiakam Pans: impressive 1000 years old baobab trees, which were depicted by the Victorian explorer and painter Thomas Baines in 1961. The incredible thing is that the landscape in the painting is still identical to the modern day landscape; nothing has changed.Visitors can witness the same incredible Baobabs island, appearing in the middle of the pans and creating a surprisingly shady spot in the middle of a white desert just as depicted by Baines over 150 years ago! Nothing prepares you for the immensity of this reserve nor its wild, mysterious beauty. There is the immediate impression of unending space and having the entire reserve to yourself. The Kalahari Reserve covers an area of 52.000 square kilometres and is the largest protected area on the African continent. It was originally established in 1961 in the heart of the Kalahari with the intention of serving as a sanctuary for the San, where they could live their traditional hunter-gatherer way of life without intrusion or influence from the outside world. However, the government relocated the Bushmen into resettlement camps outside the park, allowing them only in 2006 to return to their lands. Geographically, the land is divided into two main areas of contrasting habitat. The northern part of the reserve is covered in sand dunes with varying species of trees. While the central part of the reserve is a flat bush veld that gives way to Mopani forests as it spreads to the south and to the east along Deception Valley. The central/southern part of the reserve id more highly visited as it is easier to reach. There are many beautiful lodges that offer a variety of activities such as game-drive safaris, walking safaris accompanied by a San guide and quad safaris.Inside the Reserve there’s only one lodge and a few camping areas. The landscape is as stunning as it is diverse. The land is mostly flat and gently undulating with shrubs and grasses speckling the sand dunes and areas that bloom into many shades of green during the wet season hosting springbok and lots of predators such as cheetah, lion, leopard and hyena. The Batswana portion of the Kgalagadi Transfrontier Park was formerly known as Gemsbok National Park and lies in the extreme southwest corner of Botswana. The South African section was formerly known as Kalahari Gemsbok National Park. There is no physical barrier between the two countries within the park. This allows wildlife to move freely between the parks, and for many years there has been informal co-operation between the two authorities. This co-operation was formalised by the creation of the “Kgalagadi Transfrontier Park” in 2000, and the two former parks are now managed as a single entity, whilst still recognising the territorial integrity of each country. The land is immense and the number of visitors is very limited compared to the size of the territory, allowing tourists to enjoy the wildness of this park, especially on the Botswana side, which accounts for 3/4 of the whole territory.This being said, the park is not easy to access. In fact, if you want to visit this park, it is fervently recommended to book your visit well in advance along with an all-terrain vehicle as it is the only way to access the park.The terrain consists of red sand dunes and sparse vegetation, including occasional trees when the water flowing underground provides life for grasses and camel thorn trees. The park has abundant and varied wildlife. Often you can see springbok, hyena, eland, cheetah, leopard and even the rare black maned Kalahari lion which comes out to drink from artificial water ponds or river beds still holding a little water. The meerkat, a small carnivore, can be seen on top of small dunes. Kgalagadi is also a bird watcher’s paradise with more than 300 hundred species including at least 20 raptor species. Every park and natural reserve of this area is managed by the DWNP (Department of Wildlife and National Parks), which also supervises camps, lodges and determines times for visitors to get in and out of the reserves. Access is denied to the parks after sunset and whoever is inside the park must leave before closing time, unless they are staying in accommodations on the reserve. The government of Botswana requires proof of yellow fever vaccination only if you are arriving from a country with risk of yellow fever.